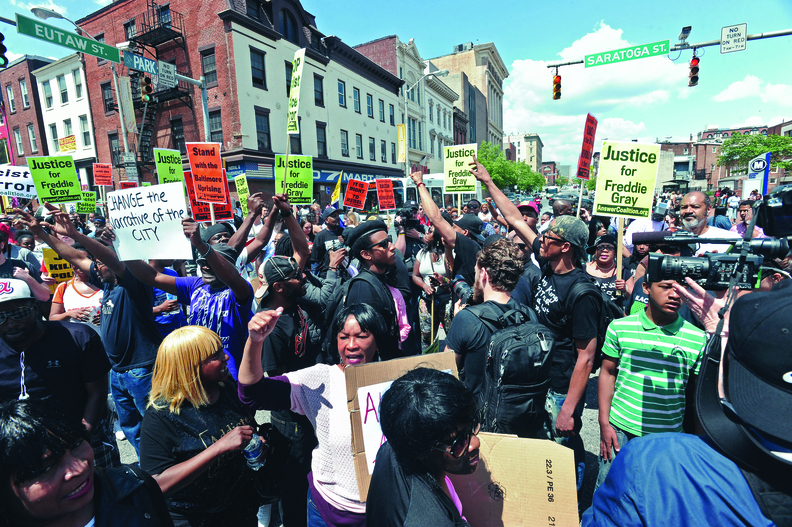 About 500 people stopped traffic at Saratoga and Eutaw streets for a short time while marching to Baltimore City Hall on May 2, 2015, as protests continued in the wake of Freddie Gray's death. The death last April of Freddie Gray Jr., the 25-year-old Baltimore man fatally injured while in policy custody, sparked violent protests in that city's poor and minority communities. The civil unrest, which included looting and angry clashes with police, ultimately led to the governor declaring a state of emergency. 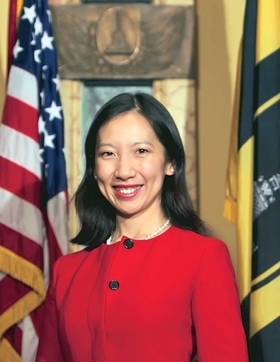 It was Dr. Leana Wen's third month on the job as commissioner of the Baltimore City Health Department. Based on her experience as an emergency department physician, she initially focused on keeping the city's hospitals safe and accessible for staff and patients. But as the protests persisted, Wen faced a new set of issues. The department had to set up transportation services for elderly individuals so they could get their medications. Thirteen area pharmacies had closed because of looting. The department established a crisis line to provide 24-hour mental health trauma counseling. It deployed teams of mental health professionals to affected neighborhoods. Those measures represented an extension of activities that many urban public health departments have taken on in recent years to tackle social conditions that can lead to unrest. Baltimore and the rest of the nation have made major advances in reducing childhood lead exposure over the past decade (the fiasco in Flint, Mich., being a notable outlier). As was widely reported after his death, Gray grew up in a west Baltimore row house filled with lead paint chips. He did poorly in school because of his inability to focus and had frequent run-ins with the law. A 2008 family lawsuit against the landlord resulted in an undisclosed settlement. But like most public health agencies, Baltimore's hadn't moved much beyond dealing with its lead problem when it came to tackling the conditions of poverty that can lead to ill health. It focused most of its limited resources on boosting vaccination rates, preventing the spread of infectious disease, and ensuring the city's restaurants were clean and safe. That attitude is changing rapidly, though. “We're the ones who really should be at the head of the table for everything—health is tied to everything,” Wen said. It's a view that's shared by a growing number of public health departments around the country. They are looking to broaden their role to include improving the overall population's health. Experts say such efforts represent an evolution of the core mission of public health departments. Health-determining behaviors such as poor nutrition, smoking and drug abuse are more prevalent in poor communities. The resulting diseases and chronic conditions are America's greatest public health challenges today. Urban public health departments are beginning to tackle the social determinants of ill health, which are now seen as a contributing factor to the social unrest of recent years. They are the primary reasons why African-Americans in particular live shorter lives, suffer from higher rates of heart disease and cancer, and have higher infant mortality rates than the rest of the nation. These health-related conditions and behaviors are also the reasons why people in impoverished communities are more likely to experience gun violence, which has devastated many inner-city communities. Urban public health departments are launching a number of new initiatives to address these drivers of ill health. They are looking for ways to reduce children's exposure to violence by educating local communities on peaceful conflict resolution. Many are targeting mental health counseling in poor neighborhoods wracked by violence. Others are taking steps to lower the rate of teenage pregnancy, which is the main reason infant mortality for African-American mothers is 2.4 times the national average, which itself at 6.1 per 1,000 live births in 2010 was dead last among advanced industrial nations. Proponents say community engagement is important if public health departments are going to develop strategies that can work for the poor. “We don't peel the layers back and ask ourselves what are the upstream things that's causing it,” said Dr. LaMar Hasbrouck, executive director of the National Association of County and City Health Officials. “There's been kind of a resurgence in looking at something called a 'health-in-all-policies' approach (that) convenes folks together and looks at the health aspects of other sectors. “So if it is transportation, if it's housing, if it's employment, (the strategy) looks at how all those things fit together in creating a healthy environment,” he said. A successful strategy requires engaging other government agencies. The Affordable Care Act, as part of its National Prevention Strategy, called for coordination among various entities to reduce health disparities. In practical terms, that means helping turn schools into better learning environments, collaborating with housing agencies to create healthier homes, expanding family planning for teenagers and young adults, and creating new and expanded pre-school education programs for the children of young parents. In Miami, a collaboration between the Florida Department of Health in Miami-Dade County, the Florida Institute of Health Innovation, Jackson Health System and neighborhood leaders works on addressing health outcomes driven by crime and violence. The project works with community members to identify evidence-based crime prevention solutions as well as address the stress-induced health conditions that can develop as a result of constant concerns over safety. Dr. Lillian Rivera, administrator for the Miami-Dade County Health Department, sees programs to address the social determinants of health becoming central to public health departments in the same way that disaster preparedness and bioterrorism response units became crucial to public safety departments after 9/11.